The latest newsletter, number Thirty-Five, from the Sylvia Townsend Warner Society, explores her links to other writers and artists. Sylvia was greatly moved by Walter de la Mare’s poem ‘Autumn’, reprinted, and she also notices in her diary that Denton Welch’s A Voice Through a Cloud shows the influence of de la Mare’s prose, a perceptive insight. Other de la Mare connections are noted. The newsletter also quotes commentary from Conor Mark Jameson about T H White, whose biography STW wrote, which notes that though his “influence has been widely felt, yet he remains curiously marginalised in literary history”. A further feature discusses the Norfolk “fisherman-turned-artist John Craske”, who was “discovered” by Sylvia's future partner Valentine Acland, and championed by both of them. He created “an embroidery honouring the bravery and skill of the fleet of ‘little boats’ which saved hundreds of thousands of troops at Dunkirk”, a work “like a one-man Bayeux Tapestry”. As well as the newsletter, the Society also publishes a substantial paperback journal of rare STW work, and commentary and reviews. (Photograph: Sylvia at Inverness Terrace in the 1920s, from the STW Society website). What is the biggest secondhand bookshop in Britain? I don’t think anyone holds the undisputed claim and maybe it doesn’t matter. These ten are all very big, and all well worth a visit. I suspect only a trained librarian or archivist could estimate the number of books very cannily. So the following is simply a summary of some of the contenders, either overall or in one country or region. Other suggestions are welcome. Astley Book Farm, Warwickshire - “the largest second-hand bookshop in the Midlands” according to its website, and that sounds right. “We hold about 75,000 books” they note. One large former farm building, with two outhouses. Also has a café. Baggins Books Bazaar, Rochester – “England’s Largest Secondhand and Rare Bookshop”, it proclaims, though some visitors are not so sure. Note that this doesn’t therefore challenge the two big bookshops in Hay-on-Wye, which is (just) in Wales. “More than half a million…” books says a local press report from November 1996 quoted on the Bazaar’s website. Over two floors. Barter Books, Alnwick – cautiously describes itself as “one of the largest secondhand bookshops in Britain” In a former railway station, it has one entrance room and then a great hall stretching out quite a long way (and with a model train set traversing some of the shelves). However, it is only on one floor. Also has a buffet. Book Barn International, Temple Cloud – an internet seller whose depot is also open to browsers, described as “one of the largest used bookshops in England” with “hundreds of thousands” of books, very cheap. Café. Could certainly claim to be the largest in the West. Book Case, Carlisle – makes no claim of this kind – the owner was diffident when I said it must be in the running, but it certainly is. 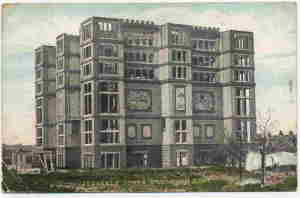 Occupies an entire large Georgian house, rambling over three floors, with a warren of rooms. Also has a café, and records in the basement. The Bookshop, Wigtown – claims to be “the largest second-hand bookshop in Scotland,” (though that is sometimes disputed) “with over a mile of shelving supporting 100,000 books”. An interesting old town house with about four large rooms, some passages and a landing. Richard Booth’s Bookshop, Hay-on-Wye – two long floors and a cellar, much brighter and better organised under new ownership and now with a café and cinema, but possibly with a certain loss of quantity. The Carnforth Bookshop, Carnforth – has never claimed to be the biggest but has a painted sign announcing 100,000 books. Two floors, though under recent ownership the stock has been winnowed down a bit, particularly the vintage hardback fiction. Leakey’s, Inverness – a characterful bookshop in a former church whose stock has been estimated at over 100,000 books, and which may compete with The Bookshop, Wigtown for the title of Scotland’s largest. 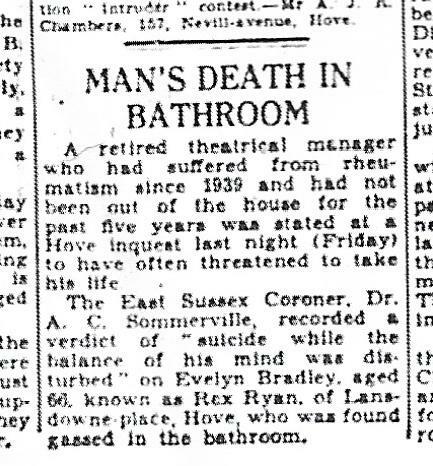 "A retired theatrical manager who had suffered from rheumatism since 1939 and had not been out of the house for five years was stated at a Hove inquest last night (Friday) to have often threatened to take his own life. 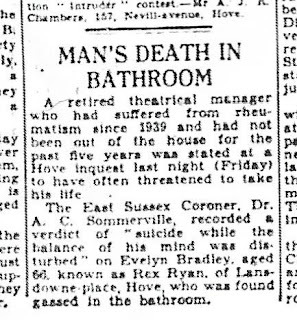 "The East Sussex coroner, Dr A.C. Sommerville, recorded a verdict of "suicide while the balance of his mind was disturbed on Evelyn Bradley, aged 66, known as Rex Ryan, of Lansdowne place, Hove, who was found gassed in the bathroom." 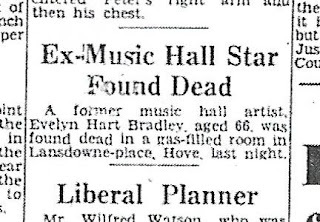 "A former music hall artist, Evelyn Hart Bradley, aged 66, was found dead in a gas-filled room in Lansdowne-place, Hove last night." 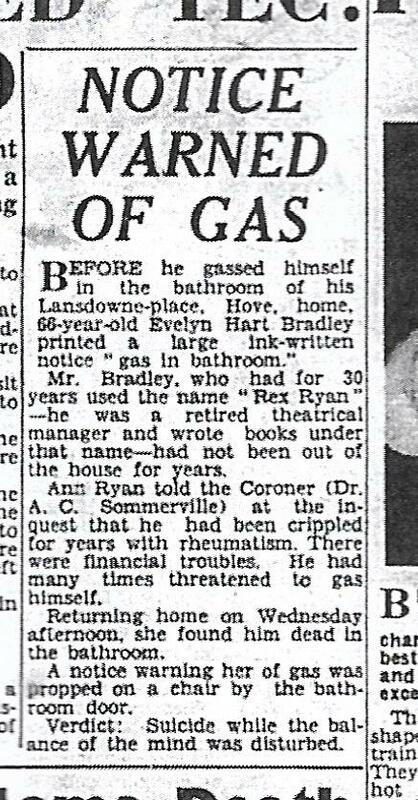 "Before he gassed himself in the bathroom of his Lansdowne-place, Hove, home, 66-year-old Evelyn Hart Bradley printed a large ink-written notice "gas in bathroom." "Mr Bradley, who had for 30 years used the name "Rex Ryan" - he was a retired theatrical manager and wrote books under that name - had not been out of the house for years. 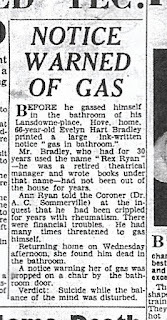 "Ann Ryan told the coroner (Dr A.C. Sommerville) at the inquest that he had been crippled for years with rheumatism. There were financial troubles. He had many times threatened to gas himself. "Returning home on Wednesday afternoon, she found him dead in the bathroom. "A notice warning her of gas was propped on a chair by the bathroom door. "Verdict: Suicide while the balance of his mind was disturbed." A sad end to a fascinating life - clearly poor health and financial difficulties had taken their toll. The last notice refers to his novels and shows that he was known as a writer. I suggested that one reason why it might look like there are fewer is that there are not so many in larger urban areas, but more in smaller towns and cities. Most leading news and commentary is Britain is metrocentric: what happens in London and, a long way behind, the other major cities, is what gets reported. Any trend in the outer reaches of the country or its smaller settlements is less likely to get attention. Where, then, are all these secondhand bookshops? As an assiduous browser, I offer the following seven suggestions for a bookish weekend break. These are all based on fairly recent personal experience, drawing on the splendid listings at the bookguide. Norwich and North Norfolk – the city of Norwich, home of the elegant essayist Sir Thomas Browne and the rediscovered spy and thriller writer W.F. Morris, has seven secondhand-bookshops and three charity bookshops. Further afield, but mostly reachable by train or bus from the city, there are at least a dozen in the towns along the North Norfolk coast or in the country around the county town. There is also a large charity bookshop at Blickling Hall, a National Trust property, and two smaller book rooms in other NT properties. York and North Yorkshire – the Roman and Viking city of York also has around seven general secondhand bookshops, plus a couple of specialists, and three good charity bookshops. Attractive train journeys from the city will also take you to shops in Harrogate, Whitby and Scarborough, while a motor tour in the Dales will allow you to call in at a few others. Carlisle and Cumbria – the city of Carlisle has one bookshop, Bookcase, but it is enormous, and could easily take up most of one day. But if you need a change of scene, take the fine coastal railway to Whitehaven, where Michael Moon has two bookshops, one also large. Or there is the highly scenic Settle-Carlisle railway, which will take you to Settle (three bookshops). Meanwhile a journey through the fells and mountains will take you in short order to Penrith (two bookshops) or Sedbergh (one large bookshop and some smaller outlets). Wigtown and Galloway – attempts to emulate Hay-on-Wye, the bookshop town founded by the genius of Richard Booth, haven’t always succeeded, but Wigtown, Scotland’s Book Town, is a quiet former county town in very attractive country in a lesser-known corner of Scotland. It has half a dozen good size bookshops plus a few smaller outlets. Not far away, at Gatehouse of Fleet (scene of Dorothy L Sayers’ Five Red Herrings) is another excellent bookshop in the old watermill. Touring will take you to small shops in Castle Douglas and the artist town of Kirckcudbright. Aberystwyth and Cardigan Bay – the leading Welsh university town of Aberystwyth has two excellent bookshops plus a charity bookshop. North up the coast is the alternative centre of Machynlleth, which has antiques, market stall and specialist bookshops. Exploring south along the sweep of the bay will bring you to Aberaeron (one), the county town of Cardigan (three or four outlets) and, just over the border in Pembrokeshire a characterful shop at Newport, and there are a few more inland. Cheltenham and the Cotswolds – the lovely Regency town of Cheltenham has three general bookshops plus two charity bookshops. Short tours in the Cotswolds will take you to the Roman spa town of Bath (five, two specialist, two charity), the abbey town of Tewkesbury (two, one a good quality charity shop), and the bohemian small town of Stroud (three including one canal charity shop) and it sister settlement of Nailsworth (two, one charity) and several other small towns with one apiece. Don’t forget to visit In Print in Stroud, the bookshop that keeps thebookguide going. There is a general idea that there are fewer second hand bookshops in Britain than there used to be, and that they are slowly fading away. Until recently, I would have subscribed to this notion too. I tend to remember not only where bookshops are, but where they used to be: and it often seems that there are more absences than presences. However, on the best evidence we have, this impression seems in fact to be quite wrong. The first thing to note is that, compared with most of the 20th century, the number of second-hand bookshops is now much higher. I haven’t seen definitive figures but I have read accounts of the book trade in the early to mid 20th century that suggest there were few shops outside London, the bigger cities, Oxford and Cambridge. Most readers tended to get their books from private circulating libraries or public libraries. Newsagents and stationers sometimes had a few shelves of used books, but not on any scale. It would be interesting to identify when the picture changed more towards what we see now: my guess would be, in the Sixties, but that is mere surmise. However, what about the more recent trend? Well, we can make a pretty good comparison between the number of bookshops now and the number thirty years ago. The current total is fairly straightforward. There is a marvellous online guide to second hand bookshops in Britain, thebookguide, run valiantly and voluntarily by the Inprint Bookshop, Stroud, Gloucestershire. This receives not only reviews of bookshops but news from readers about closed or newly opened or discovered examples. It’s about as definitive as you can get. On 21 August 2017, this website reported: “We list 1217 bookshops in the UK and Ireland, with only 287 of them run by charities.” Of these, about 30 are in the Republic of Ireland, so the UK total is therefore 1187. To get a similar figure for thirty years ago, we must consult Driff’s Guide to the Secondhand & Antiquarian Bookshops in Britain. Driff was the pen-name of a noted figure in the book trade and his guides won fame (or notoriety) for his pungently-expressed opinions of the bookshops and their owners. This guide ran through six editions, and I have consulted the 1984 edition, simply because it’s the one I have. Driff was so confident that he had listed every bookshop in the country that he offered a free copy of the next issue of the guide to any reader who sent in details of any he had missed (or any that had closed). He was also obsessively diligent, relating entertainingly his quest for shops where he had only the vaguest details to go on. For this issue, he noted that all of the entries had been double-checked in the last two weeks of July 1984. He lists 942. So we can see that there are indeed more second-hand bookshops in the UK than there were thirty years ago, in fact about 25% more. That seems fairly conclusive, but there may be some objections. The Inprint guide includes charity bookshops. Note that these are mostly full bookshops, not those that have a few shelves of books among other charity donations such as clothes, records and bric-a-brac. It will be seen that if these 287 charity shops were discounted, there would indeed be rather fewer now than then. But I don’t quite see why they should be excluded: they are second-hand bookshops, and for the reader or collector, who owns them is irrelevant. That seems to me a perfectly fair test. And in any case Driff’s guide also included some of these types of entries. Driff’s own definition of a secondhand bookshop was “anywhere that has more than a thousand books and is open more than two days a week.” He added that “Some antique shops have been included” where the owner had a serious interest in books, and some stalls where they were near bookshops. Further, Driff tells amusing anecdotes of shops he has included that seem to be pretty much semi-closed, or with other highly erratic characteristics. It's also true that Driff lists some bookshops that are not included in his numbering system: some are only rumoured, some are stalls, curio shops etc worth a look if you're in the area, some just seem to be afterthoughts. Overall, I think it is likely that the Inprint guide is slightly more inclusive than Driff’s, but not significantly so. Why, then, do so many readers and collectors think there are fewer second-hand bookshops, when this is not apparently supported by the evidence? Well, I suspect it is one of those myths that stays current because it sounds right and fits in with our assumptions. We expect online bookselling, electronic books and so on to have made an impact, and it no doubt has, though physical bookshops can sell online too, so they now have another avenue for sales. 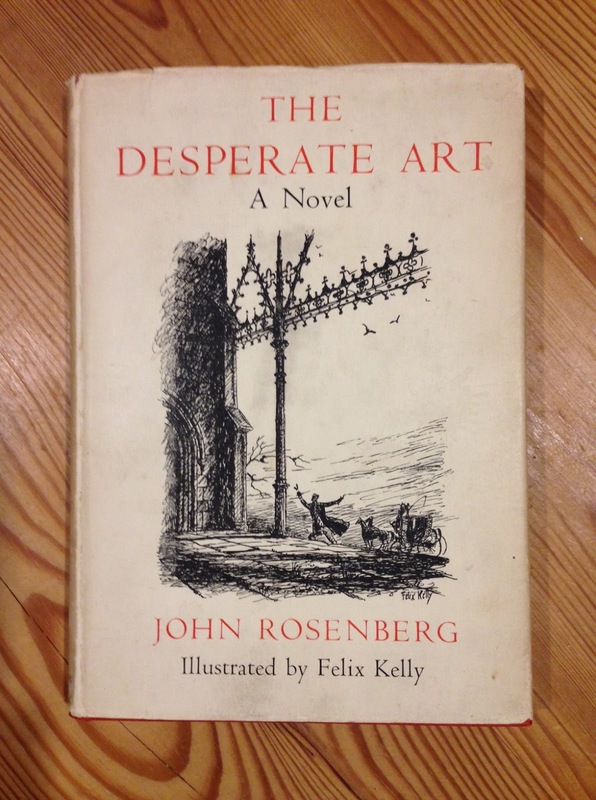 There is also, in my experience, often an innate lugubriousness about some second-hand booksellers, who may themselves therefore contribute to the idea that the trade is in irreversible decline. It also seems to be true that there are fewer bookshops in cities, where they might be noticed more. However, there may possibly now be more in smaller towns, especially those with a strong tourist trade. It’s also possible that over a more recent period – say, the last 10-15 years – there has been a dip from a previous peak. But even if this is so this would not alter the broad picture of a substantial increase over a reasonable span of time. 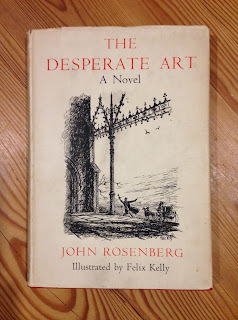 Let us conclude, therefore, by celebrating those doughty, determined, often interesting and independent, individuals who carry on the chancy trade and desperate art of second-hand bookselling. Note: amended to get the sums right and to note the bookshops Driff mentioned but didn't number. 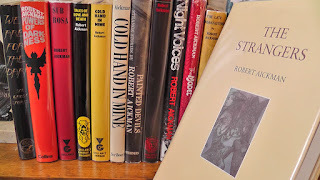 In 2014, after several years wondering why Bowling Green University Library seemed to have such an odd and incomplete collection of material by Robert Aickman, we discovered that the author’s full literary archive was still in private hands here in the United Kingdom. It had been passed on to Heather Smith, a friend of Aickman’s and his literary executor (after the death of his original executor, Felice Pearson). We visited Heather and Graham Smith to consult the archive and spent many fascinating hours looking through it and talking to them about their friendship and Waterways campaigning with Aickman. 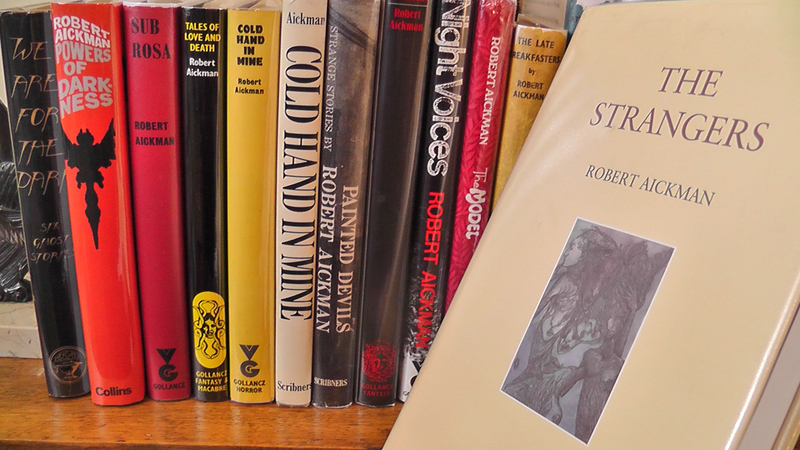 We were also able to make a full inventory of the archive which contains, among other material, the finished typescripts of nearly all of the forty-eight strange short stories for which Aickman is acclaimed, as well as his longer works of fiction, autobiography, philosophy and non-fiction. Aickman also kept copies of most of his published and unpublished writings, as well as professional and personal correspondence. It was through Heather and Graham’s enthusiasm, generosity and friendship that we were able to put together and publish The Strangers (Tartarus Press, 2015), a collection of previously unpublished and uncollected writings by Aickman. Reading the typescript of the title story we felt that it was as good as any of his published tales. (We later learned from Aickman’s friend Jean Richardson that ‘The Strangers’ had probably not been offered for publication because it too closely described living people.) Two stories that we published in the book were subsequently selected for annual ‘Year's Best’ anthologies. 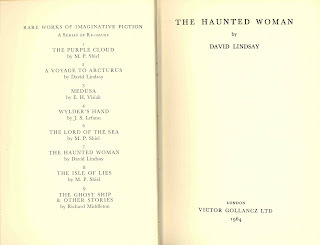 Several years before this, Leslie Gardner at Artellus Ltd (for decades the literary agents for Robert Aickman’s work) had first mentioned to Heather that she might consign the Aickman archive to a library so that it could be properly conserved and made easily available to researchers. Finding a home for the archive was conducted by Leslie’s contact, Peter Grogan (formerly of the Gekoski group), whose knowledge of the international market in this field cannot be underestimated. The result of Peter’s skilful work has been the acquisition of the archive by the British Library — the best possible home for this treasure trove. To celebrate the acquisition of the archive, the British Library is hosting an evening of readings and discussion with special guests including Ramsey Campbell, Leslie Gardner, and Jeremy Dyson. ‘Even Stranger Things: A Night for Robert Aickman’ will be held on Fri 10 Nov 2017, 19:00 - 20:30. Tickets are available from the box office. 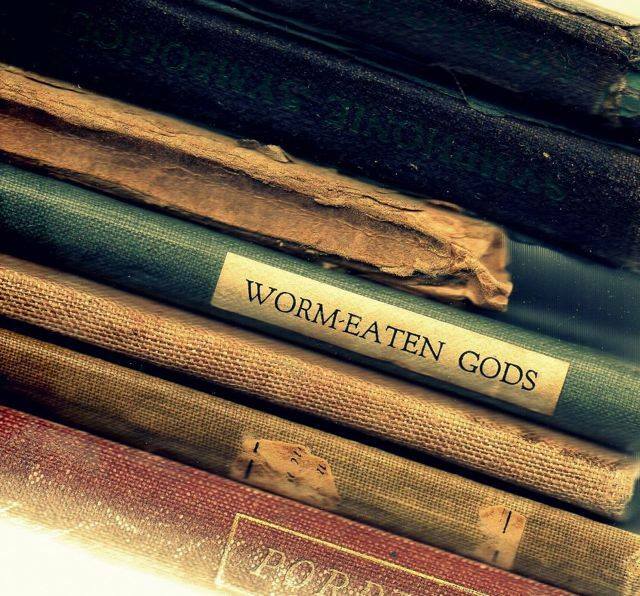 The London publisher Victor Gollancz (1893-1967) clearly had a soft spot for eclectic books, including fantasy. Twice during his lifetime he published a series of fantasies, though he carefully avoided calling them such. 1. 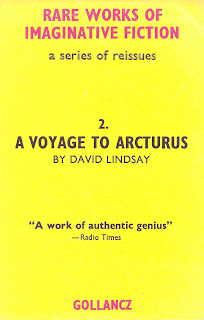 A Voyage to Arcturus, by David Lindsay. Published August 1946 at 8s 6d, just a little over a year after Lindsay's death. 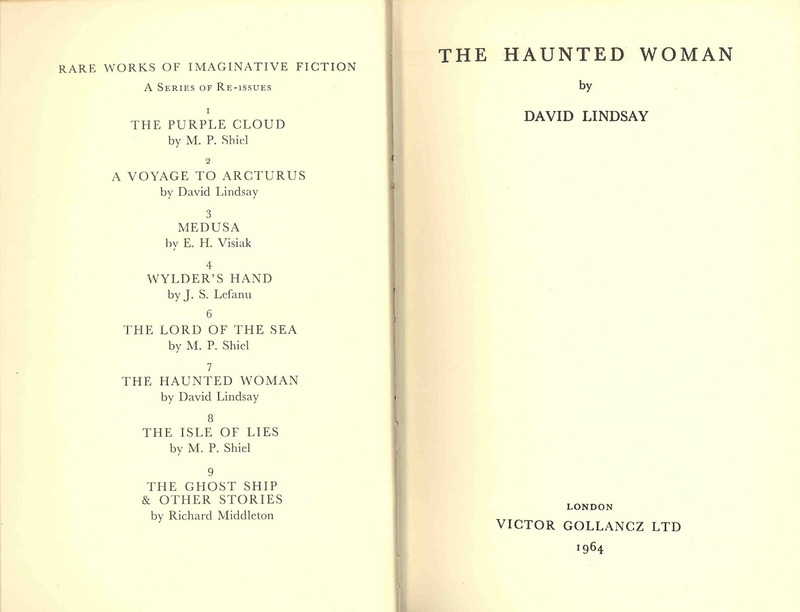 Gollancz had bought the publishing rights to Arcturus and The Haunted Woman from Lindsay's widow. 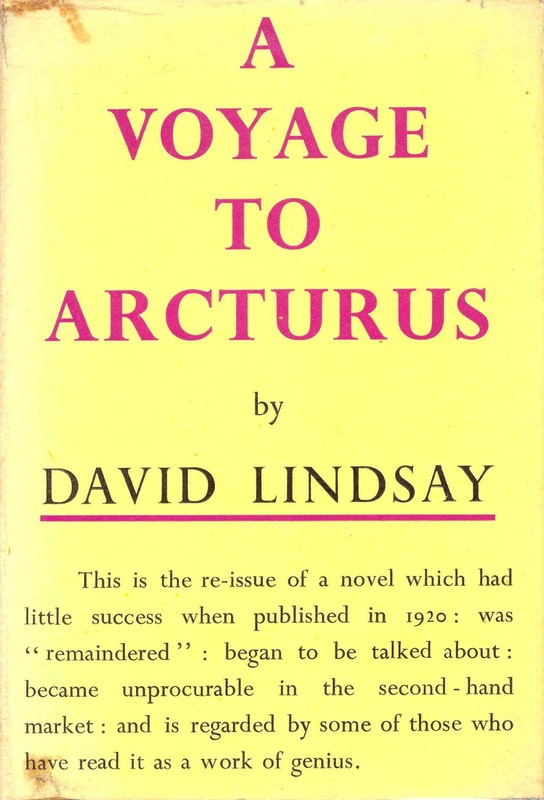 This edition includes a one-page "Publisher's Note" by Victor Gollancz, which publishes for the first time the (accurate) statement that of the small 1920 first edition of Arcturus, "596 copies were sold and 824 'remaindered.'" 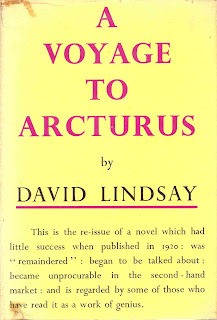 Most rare booksellers have latched on to the first number and ignored the second one, making the first edition of Arcturus seem all the more rare. But those 1,430 copies were in fact sold, as the original publisher's ledgers confirm. 2. 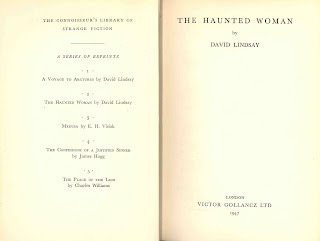 The Haunted Woman, by David Lindsay. Published in January 1947 at 7s 6d. 3. Medusa, by E.H. Visiak. Published January 1947 at 7s 6d. Gollancz himself had published the first edition of this book in 1929. 4. The Confessions of a Justified Sinner, by James Hogg. No Gollancz edition was ever published. The Cresset Press published an edition in September 1947. Perhaps Gollancz didn't want to publish a book which had a planned competing edition. 5. The Place of the Lion, by Charles Williams. Published in February 1947 at 7s 6d. Gollancz himself had published the first edition of this book in 1931. 1. The Purple Cloud, by M.P. Shiel. Published 13 June 1963 at 18s. 2. 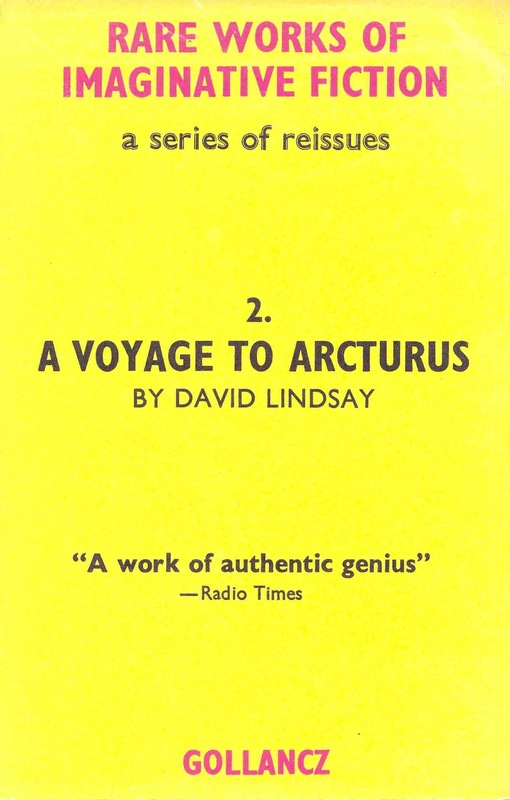 A Voyage to Arcturus, by David Lindsay. Published 13 June 1963 at 18s. 3. Medusa, by E.H. Visiak. Published 13 June 1963 at 18s. 4. Wylder's Hand, by J.S. Lefanu. Published 24 October 1963, presumably at 21s. 5. The Greater Trumps, by Charles Williams. Announced but never published. Gollancz himself had published the first edition of this book in 1932. 6. The Lord of the Sea, by M.P. Shiel. Published 24 October 1963, at 21s. 7. 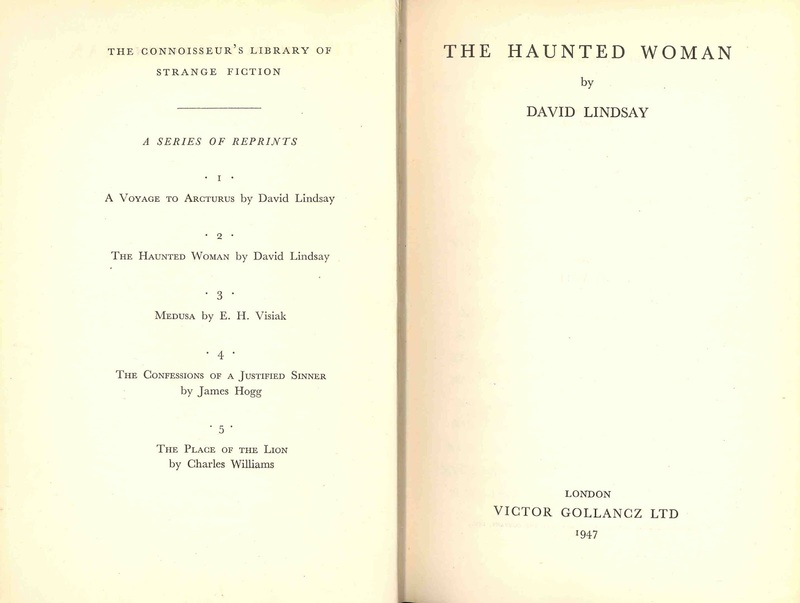 The Haunted Woman, by David Lindsay. Published 16 April 1964 at 21s. 8. The Isle of Lies, by M. P. Shiel. Published 16 April 1964 at 21s. 9. The Ghost Ship & Other Stories, by Richard Middleton. Published 16 April 1964 at 21s. In all, these titles lived up to the advertisements describing the series as "The Connoisseur's Library of Strange Fiction" and "Rare Works of Imaginative Fiction."